Many users are suffering the low FPS issue after Windows 10 Creators Update when playing games, which make the games like Rocket League, CSGO and Overwatch get stutters and almost unplayable, with the frame rate dropping from 130~160 to 30~40. Although the release, Windows 10 Creators Update, is meant to boosting game experience via game mode. Luckily, below are several tricks which have been proved workable by those who encountered reducing FPS and stuttering game issue since Windows 10 Creators Update. The Game Bar and Game DVR of game mode, the new features that Windows 10 CU brings us, are said to be a possible culprits which lead to FPS drops and game stuttering problem. Since they are set “On” by default in the Game mode setting, you should turn off them manually as below tutorial shows. 1. Hold and Press the Windows shortcut keys Win + I to open Windows Settings. 2. Choose Gaming -> Game Bar. 3. Toggle the “ON” switch under the “Record game clips, screenshots, and broadcast using Game bar” to “Off”. 4. Uncheck the “Show game bar when I play full-screen games Microsoft has verified” checkbox. To disable the Game DVR in the Xbox app to fix Windows 10 game lagging and lower FPS malfunction after Creators Update, below is how. 1. Click the Start button, and then type Xbox to open it. 2. Go to Settings -> Game DVR. 3. Ensure the “Take screenshots using Game DVR” selection is “Off”. Then you should be out of the low FPS hassle on Windows 10 CU and be able to enjoy your game. If the game stuttering problem and the FPS continues, try the following solutions. Incompatible graphics drivers like NVIDIA drivers may cause the blue screen, faulty frame rate, video stuttering during the gaming, resulting in a slow PC on the Creators Update eventually. What’s more, faulty graphics drivers can cause missing game components, which could bring about missing errors such as.Net Framework, MSVCP120.dll, XINPUT1_3.dll etc. To exclude that possibility, you can use Driver Talent, a professional driver troubleshooter, to update the compatible drivers or repair the broken or missing game components for Windows 10 CU. 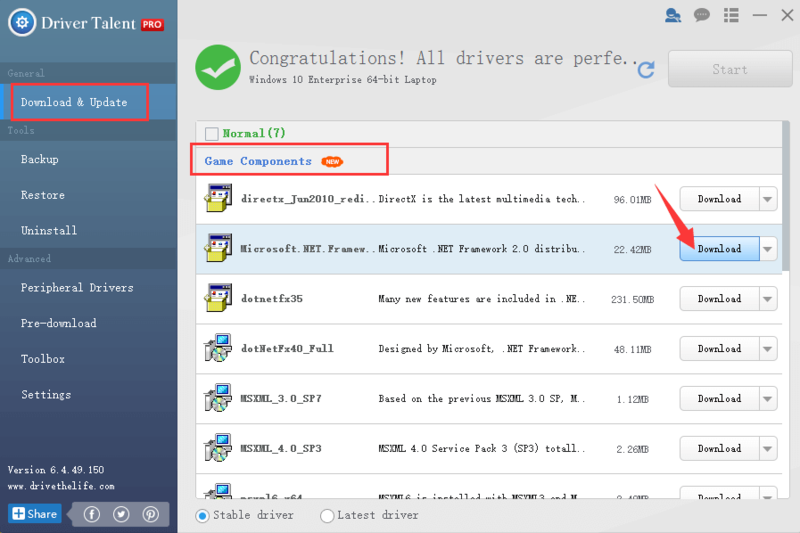 Perform the easy steps below to get the WHQL display drivers or the official game components like .Net Framework, DirectX, Visual C++ Redistributable Package, etc. Click “Scan” to let Driver Talent scan for all the incorrect drivers installed on Windows 10 Creators Update. Click “Download” or “Update” to install the best-matched drivers to resolve the Windows 10 lower FPS after Creators Update. Notes: Backup your drivers in advance in case you may need to roll back drivers in the future. Reboot your computer to make the newly updated drivers come into effect and then check whether the game runs smoothly and the FPS drops issue are fixed. Pro tip: To download and install the missing game component, go the Game Components tab and click the Download button to do so. Disabling the DiagTrack , also known as the connected user experiences and telemetry service, is also said helpful for handling Windows 10 FPS drops glitch for the Creators Update. 1. Click the Start button, and then type Servives to open the Servives App. 2. Locate “Connected User Experiences and Telemetry” under the Services (Local) category and then double-click it. 3. Click “Stop” in the “Service status” section. 4. Select "Disabled" under the "Startup type" drop down menu and then click "OK" to save changes. Check whether the FPS dropping and game freezing bug persists or not. If all the above efforts come out of avail, you may consider recovering your previous build to tackle the dropping FPS during game playing on Windows 10 Creators Update computer. Here you can select which Windows version you want to revert back and follow the on-screen tutorials to roll back to Windows 10/8.1/8/7 to fix the Creators Update lowering the FPS frame rate hitch. Hope the annoying low FPS gaming experience after Windows 10 Creators Update can be resolved after reading this post. If you have more workarounds on fixing dropping FPS and stuttering game error, please share with us in below comments section or go to OStoto official forum for further discussion.